Make your way to the Pyramid. 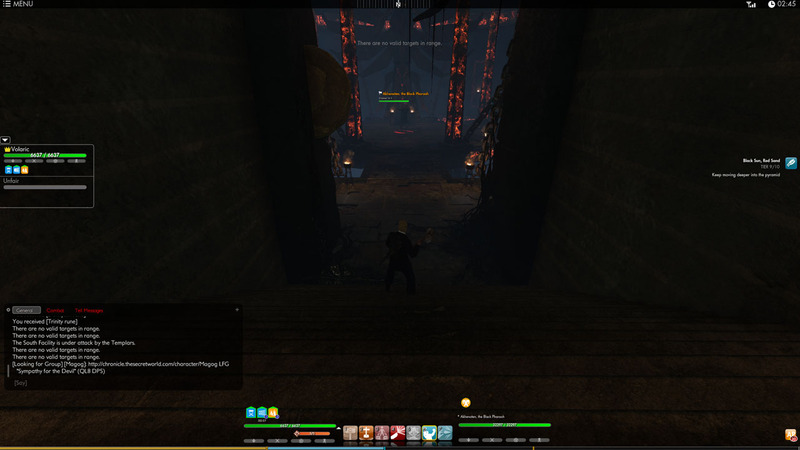 The quickest way from the Orochi camp to the Pyramid is to die and resurrect at the Anima Well in the South Eastern corner of the map. When you are in front of the Pyramid, the mission will update and tell you to play “The Song of the Sentinels” Do this by right clicking on it in your inventory. 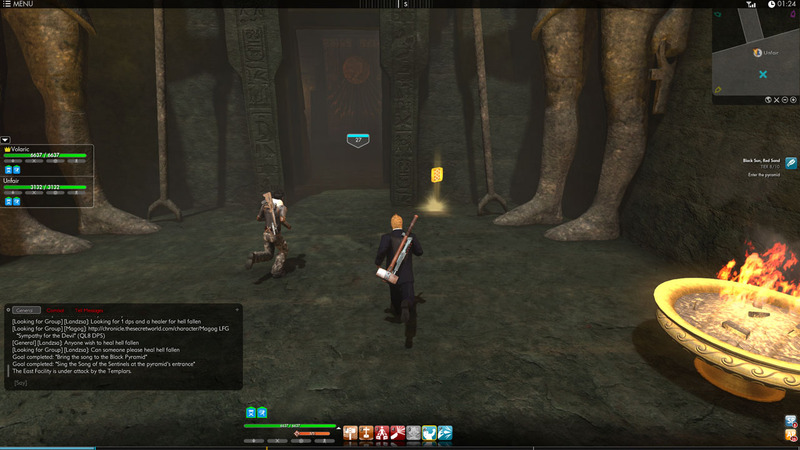 After the music stops playing, head inside the pyramid, making sure to grab the lore on the way in. I’m not going to lie, if you are in low level gear, or do not have the right abilities, this next part will be impossible. Details provided in the next section. Enter the Black Pyramid for the final encounter for Black Sun, Red Sand. First thing is first. You enter a room and are soon swarmed by about 8 cultists. You need a lot of burst AoE and potentially a slow if you aren’t a tank. The reason for burst is because they heal themselves. The reason for a slow is because if they hit you and you don’t have a big hp pool, you will die in a few seconds. You need to face three waves of these back to back to back, and if you don’t kill them fast enough, you will have to deal with more than 1 group at a time. Once you finish off the first three waves, you discover why you had to free so many villagers in the last two zones. They all arrive to help you! They will swarm the room and fight the rest of the enemies. I recommend going with the group that goes straight forward and running into the final bosses chamber to face Akhenaten, The Black Pharaoh. 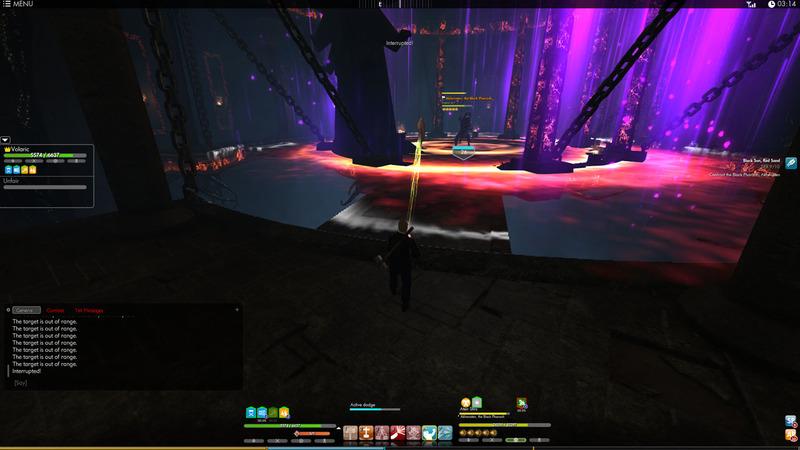 NOTE: If you need to relog at any point during this mission and you have already made it to the final chamber, the next time you zone in you will be spawned outside the solo instance and have to repeat everything. 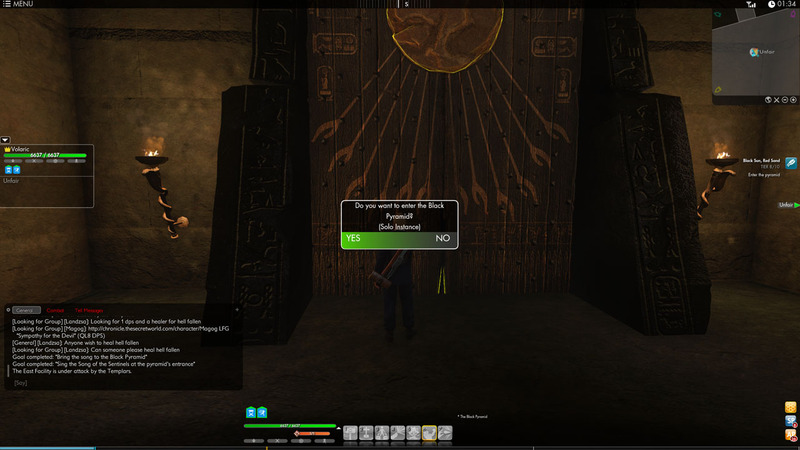 HOWEVER, the door to the final chamber will now be open, you just hit your sprint button and make a run for the end. The trash from the entrance room will not follow you to the final encounter. This fight is going to be easy if you can pay attention to your surroundings. 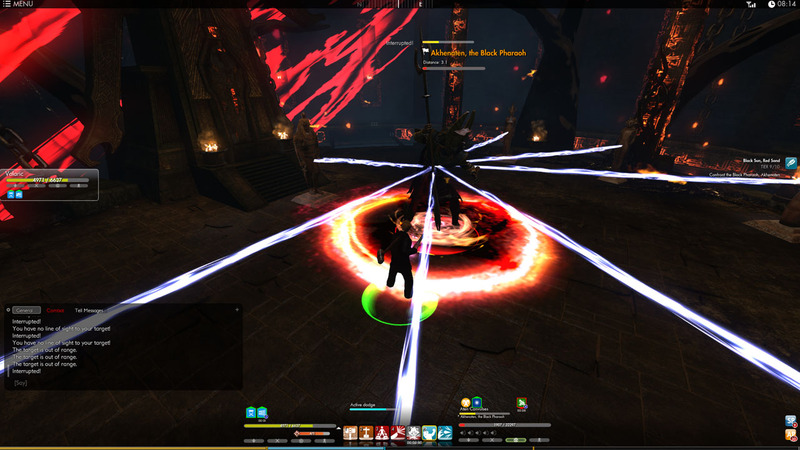 The boss himself does next to zero damage to me(then again, I am in full tank gear/talents) , so you might want to bring a minor heal, but you will probably need a health potion. He has Five things to watch out for. 1) A frontal cone attack. Standard stuff, move out of the way to avoid it. 2) He starts channeling an attack that consumes the entire inner battle arena. During the first bit of the fight, this isn’t a big deal. You have three bridges you can run across to out range it. I wanted to check if it would be instant death, and I can say that it isn’t. It does about 3k damage to my tank, but that’s enough to kill players I’ve done dungeons with, so either stack some hp just in case you don’t make it in time, or just be sure to be pro at dodging it. When his HP gets low, he will despawn 2 of the 3 bridges, leaving only 1 Up. Stay in the center whenever possible. When he begins casting, quickly look at the bridges. The ones that are about to disappear will glow white slightly before going away. If it turns white, pan your camera to the next bridge until you figure out which one will be safe. Use active dodge or teleport abilities to gain back some of the ground you lost looking for the right bridge and you should be fine. 3) He will flat out kill your character three times during the encounter. When he does, you need to click a statue to come back to life. Each Statue you click will either give you a buff, or debuff the boss. Every time you come back from the “death”, your hp is restored to full. 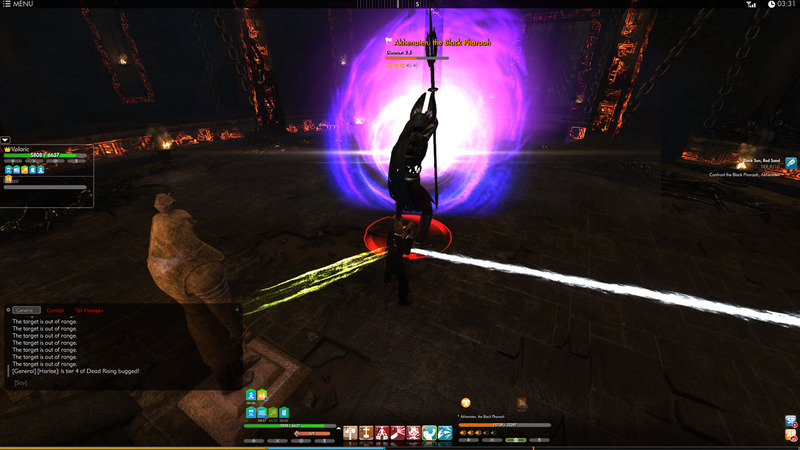 4) After he has killed you twice, he will start ocasionally casting a giant purple beam and rotate. Those of you that have ever played a Diablo game will recognize this move as it is exatly the same thing, except for the fact that it doesn’t follow you, but goes in a predictable circle. I also stood in this to see how much damage it did. As a tank, the damage was negligible. 5) After X time passes, the boss will go into evil tentacle monster mode. The red circle on the floor under him spreads. I stayed out of it and killed him before it touched me or forced me out, but I cannot imagine anything good happening if it touches you. Once you defeat him, watch a short cut-scene and you will be teleported outside the Pyramid, ready to continue in your adventures. A showcase of lore and the area for Black Sun, Red Sand Tier 10 can be found here. 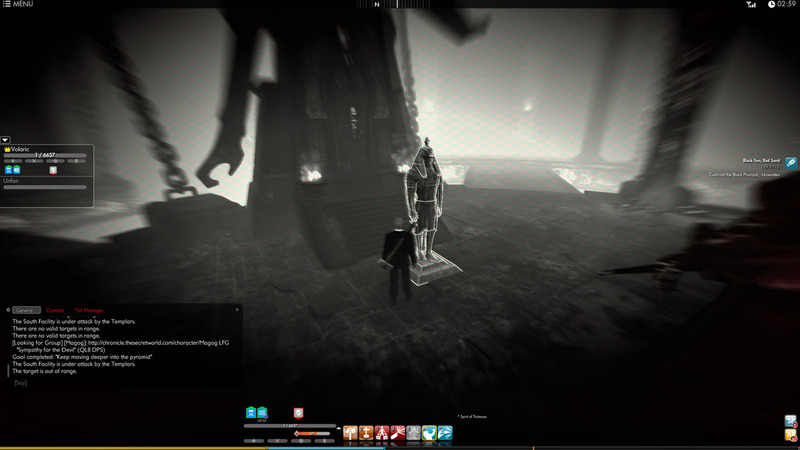 I think the statues that resurrect you during the boss fight are random. In my experience dying to this guy a few too many times, I’d click the same statue, which was the far right one (based on where you enter the room). And each time it would provide me a different buff, once it was a DoT on the boss, another time it was a Crit / Pen / etc. Rating increase for me, and the last one I remember gave me a “Leech Effect” bonus. So I don’t know if there is a set buff per statue. I did die once and had the same statues. Moutemouia was giving me heal buff. after 2hrs of hitting this guy i gave up. i use the statues, but every now and then he will kinda vanish and reset, is there an order for the statues to be able to kill him properly? It’s not exactly a bug – or at least it’s predictable – when he respawns. I fought this guy off and on for a week and only today discovered (with the help of another player) that it’s IMPAIR that causes him to respawn. I removed my 1 active and 1 passive ability that IMPAIRs … and he was no challenge at all. If he’s respawning on you .. remove IMPAIR abilities. Either they nerfed this guy or I was just lucky–I killed him on my first shot (after reading your excellent guide). FYI, I did get hit by the Red Circle of Death once, and I can confirm it’s not an instakill–I was in mostly DPS gear with about 4200 health and it took me down to a few hundred. I was still able to kill him after that. I had none of the trouble the other posters mentioned with the statues. Hemitneter directed a beam at him, and I think it is the channeled damage because his health was significantly faster. Moutemouia and Hemitneter was a nice combo. I’m not sure on the third choice, Thutamose seems as good as any. Note, when the bridges disappeared, the bridge I was looking at vanished but there were two chains running across on the edges where the bridge was, I jumped on one and ran across (fairly small target to jump to). After his damage spell went off the bridge reappeared. Nef = Unknown buff to you. Doesn’t heal, buff, or effect recharge. If anyone has an idea? If the bridge you enter across vanishes it leaves a horizontal chain either side of where it was. I just used the one bridge and ran across one of the chains instead of worrying about which bridge(s) vanished. Not sure if the other 2 bridges do the same as I didn’t go near them! 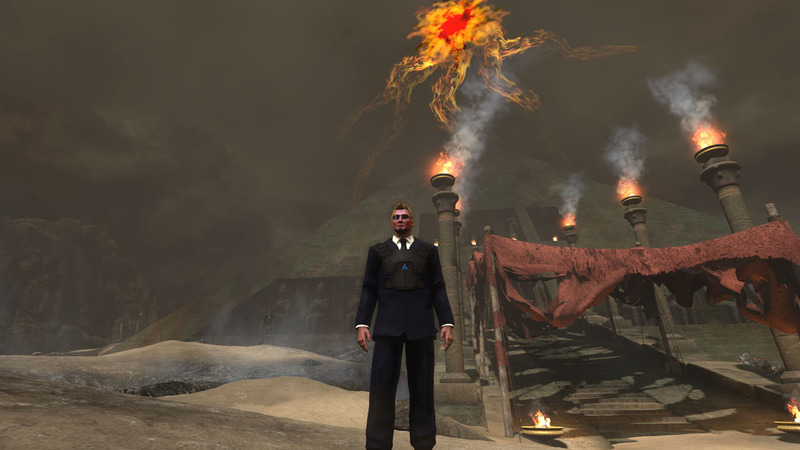 I guess this is about where I give up on TSW. 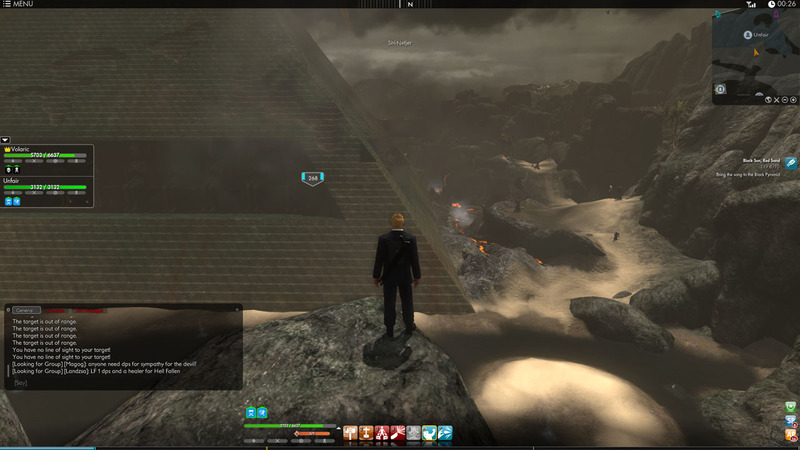 Can’t get past the waves of cultists in the pyramid. Seven tries. I am not a fast kill and I maybe have two dead in the first wave before the second wave joins them and then I’m doomed. I have a slow AOE and I have a frenzy AOE. Doesn’t matter. I don’t really see how going back and getting more skills is going to help, my equipment’s as high quality as I can get, and due to their asinine design making all the most interesting/challenging parts of the game solo only, I can’t get help. Can’t see my alt getting through this either. Came in here to see if there was a secret to it … nope, apparently not. Oh well! Anybody want to suggest an AR build that will get me through these cultists? Strangely, this is the first time in the game up to now that my usual build (a pure AR solo/leech build, but with more AOE than the one listed on this site) has been inadequate to the task. Good positioning might be to stand always facing two bridges. When he emotes you can write off two right away. Just turn around and check the others. This is a fecking AWFUL mission. I’m QL9, pistols/blood, no matter how I swap my skills around I just can’t kill the first two waves. 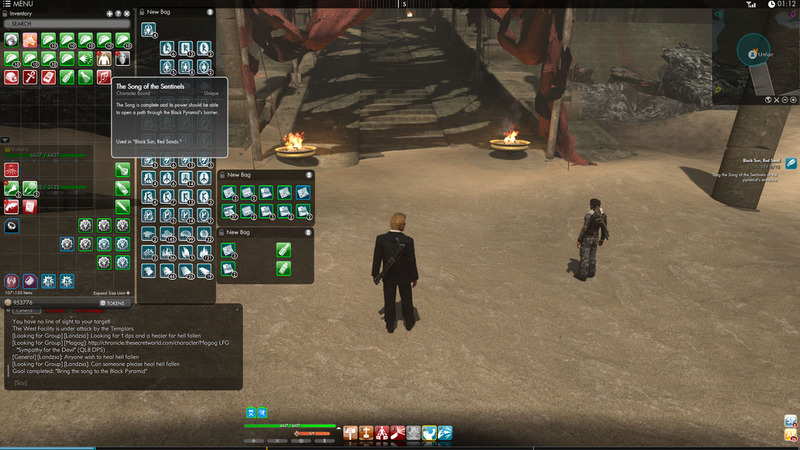 This seems to have been updated – the waves of cultists are countered by a dozen or more Orochi agents that follow you in. As for Akhenaten himself… he’s an irritating piece of work. Had him down to about 5-10% health, he pulled his monster tentacle maneuver and completely healed. Or possibly reset. Not sure what the hell happened there. Other than the required deaths, I didn’t have any real problems until the “cheat”. I actually parked on the bridge at the entrance and shot him from there. As long as I was CLOSELY centered on the bridge, it threw me back to the ledge every time it vanished, rather than dropping me to my doom (as one might expect). I went in with QL10 gear AR/Pistols. Anima Shot for the builder and Fire at Will for the consumer with Turn the Tables for spot heals and Healing/HoT pots as needed. Kite the mob around the four pillars nearest the door that you came in and you should be able to last until the NPCs come in. Just a head’s up on the red circle. I didn’t stand in it either, so I can’t guess what awful thing it will do to the player. But, I went across the bridge and waited it out, and I *can* tell you that. if it completes, he will heal COMPLETELY. You have to kill him before it finishes, or die trying.